KITCHENER — Bill Fantin conducted an introductory Japanese lesson for guests at a manufacturing summit in Kitchener on Thursday. There’s “kaizen,” or the idea of continuous improvement. “Jidoka,” or intelligent automation. And “Genchi Genbutsu,” the concept of “go and see” — going to the source to solve a problem or to see how something’s done. They’re among the tenets of the Toyota Production System, said Fantin, purchasing manager for Toyota Motor Manufacturing Canada’s Cambridge facility. And it speaks to the ways in which Toyota blends tradition and innovation in its operations. “So often, innovative ideas really focus on the basics,” noted Fantin, addressing the annual summit presented by the Greater Kitchener Waterloo Chamber of Commerce. A high-tech company is still only as good as its people, and Toyota puts great importance on training and talent development, Fantin said. Its global production centres are simulated manufacturing facilities that both new hires and veterans attend for training. In many cases, humans and automation coexist in the plants — exoskeleton lift assists ease heavy loads, and collaborative robots work alongside humans. Since 1988, Toyota has invested $8 billion in its plants in Cambridge and Woodstock. Last week, it announced $1.4 billion in upgrades for production of the next generation of RAV4 sport utility vehicles at both plants. About 8,000 employees work at the two plants. 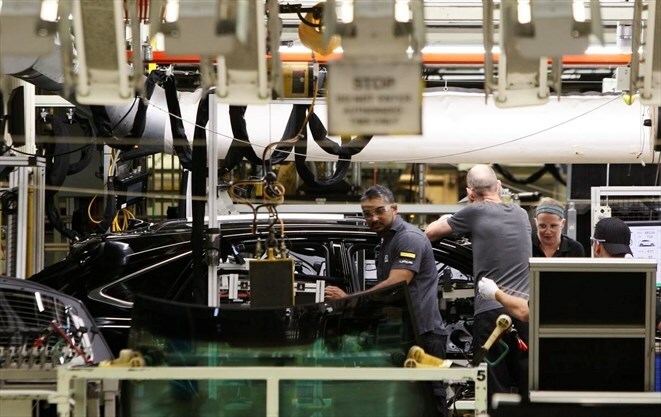 As Toyota looks to the future, the Canadian plants are well-situated to tap into the talent in the technology corridor from Toronto to Windsor, Fantin said. It has established an Internet of Things innovation lab at Kitchener’s Catalyst137 campus, which could help the company achieve some of its admittedly lofty goals, Fantin said, including zero injuries, defects and downtime. A connected workplace will provide usable data that will improve efficiency and even help to predict a problem before it becomes one. Vibration sensors on equipment, for example, can help to predict breakdowns. Investing in people and process, technology and innovation keeps Toyota’s facilities competitive, both within the company and on the world market. Even a slight improvement in efficiency can have significant results, Fantin noted. Toyota Motor Manufacturing Canada is running at a 95 per cent operating rate, he said. If they can raise that a notch to 96 per cent, it will gain profit of about $200 per vehicle. “You can see why it’s got a lot of attention on it,” Fantin said. Article written by Brent Davis for the Waterloo Record. Read the original article here.